Ok, America, the Jesuit Review isn’t my go-to read on the psychology and sociology of AI. To be honest, I’d never heard of the publication, although its masthead claims it as “the leading provider of editorial content for thinking Catholics and those who want to know what Catholics are thinking”. Who knew? A while back, we added Artificial Intelligence as the theme for one of our free Significance Content™ feeds. Since then, it has been delivering, daily, the freshest, most engaging content it can find on the subject. Last week, that included some fresh angles on an announcement from HPE, some notes on Design for Augmented Intelligence from Medium (well worth a read, BTW). 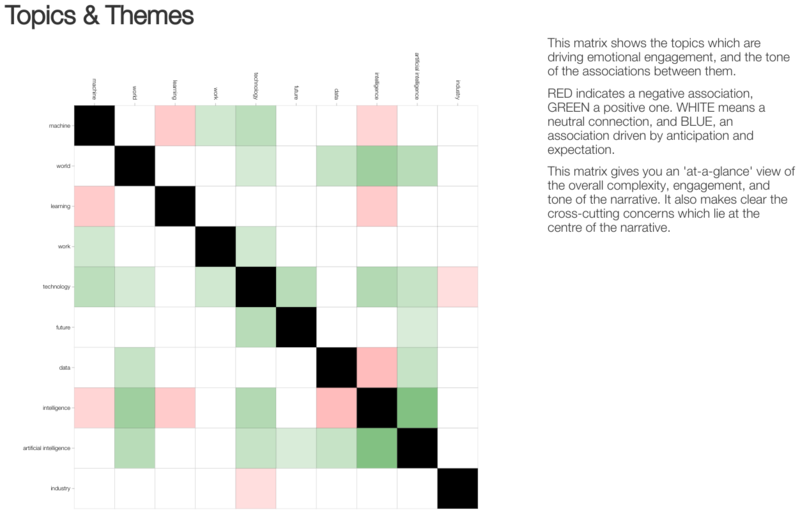 All good stuff to quickly get up to speed with what matters in the sector and the differing viewpoints on its significance — all accompanied by earth.ai‘s detailed analysis of Topics and Themes (shown) and emotional response. And then there’s that article from the Jesuit review: What would Jesus do about Artificial Intelligence? Become More Human. It’s a great read, from an unexpected source. Fresh, clear and engaging, which a unique and provocative angle on a familiar theme (humanity vs its simulation). And it wraps up with a quote from poet Gerard Manley Hopkins. How many of your daily newsfeeds deliver that? Sign up for our daily AI update for free, via email or RSS. Or register on our site and you can roll your own, on any topic you want.